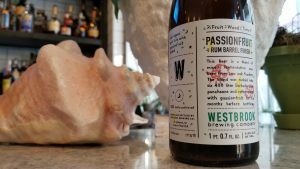 Westbrook is one of our favorite breweries and this new Fruit/Wood/Time Series is another reason why. First release we got our hands on was the montmorency cherry which was aged in wine barrel and oak foeder before adding cherries for six months. End result was tart slightly funky cherry sour. This newest release is even better. This is classic sour aged in oak and then racked into Barbados rum barrels and aged on fresh passionfruit for six months. Resulting beer has passionfruit-vanilla nose and drinks tart and floral.